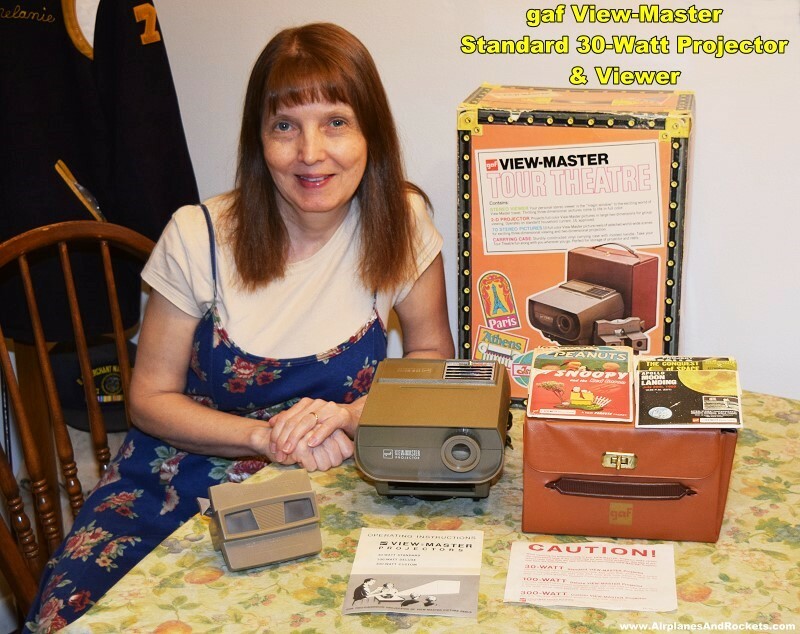 To the left is Melanie with her gaf View−Master "Tour Theatre" set that she had as a little girl. She took better care of her stuff than I did, so a lot of her toys and dolls are still around decades later. 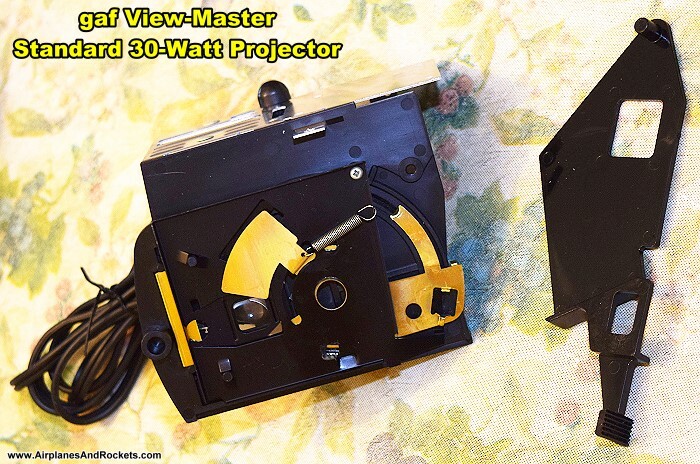 It came with a Standard 30−watt projector and a hand−held stereo viewer. 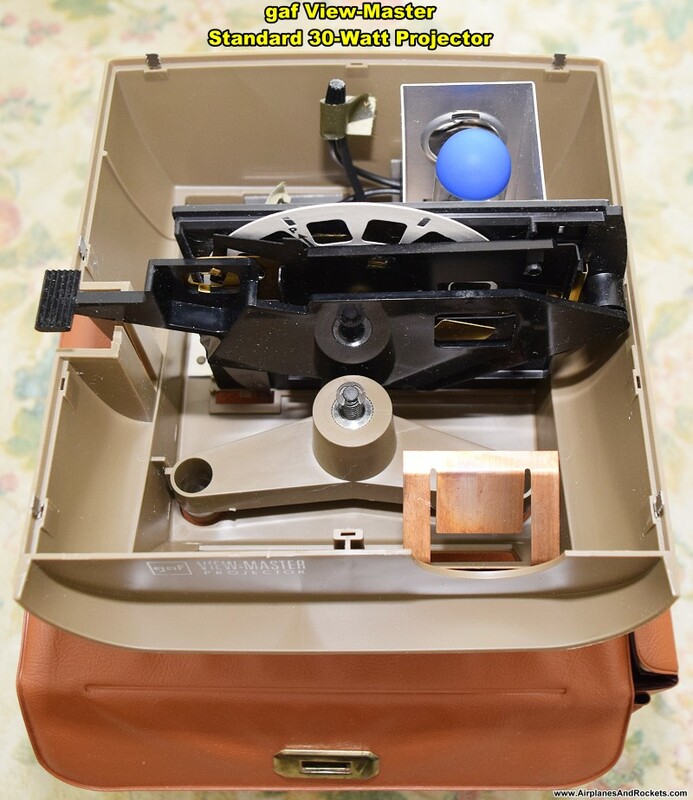 Also included was a nice case and a few reel sets with various places around the world*. Being a Peanuts fan like me, she had a couple 3−reel sets: "Snoopy and the Red Baron," and Peanuts." We have a "Little Drummer Boy" and "Dennis the Menace" set, too. The others are long gone. I had just a hand−held viewer. See my space program reel sets. 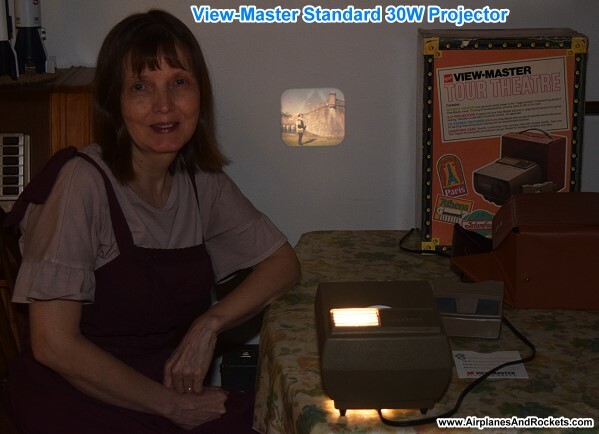 The hand−held View−Master viewer that created a 3D scene by using a pair of stereoscopic images fed individually to each eye. One of the Peanuts reels has a frame showing how those stereoscopic images were created using two cameras set up a distance apart so that each had a slightly different perspective on the subject, just as your eyes have. There are 14 frames in each reel, so using two frames per 3D scene, that makes 7 scenes per reel. Replacement 7-14-scene reel selector lever installed on mechanism. 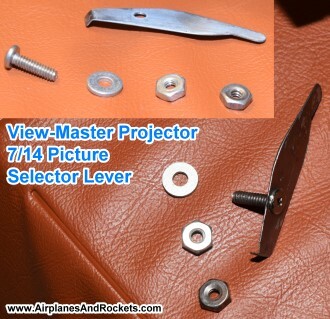 Home-brew 7-14-scene reel selector lever. 6-32 bolt is soldered to steel lever, and then the head ground down to provide needed clearance. Side view of projector reel advance mechanism. 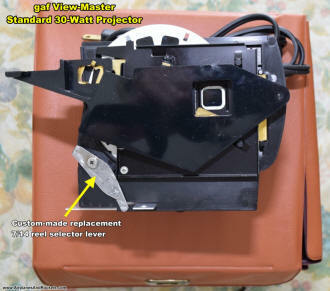 Westinghouse RVR115, 120V, 30W light bulb for View−Master Standard projector. The projector, on the other hand, cannot create a 3D image on the screen (or wall). Therefore, a standard 3D reel only has 7 unique scenes on it. 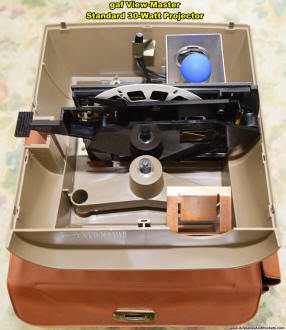 Special reels were sold for the projector that had 14 unique scenes on it. 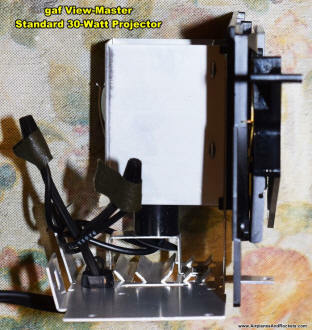 As such, the projector designers provided a lever to be positioned for either a 7-scene or a 14-scene reel. 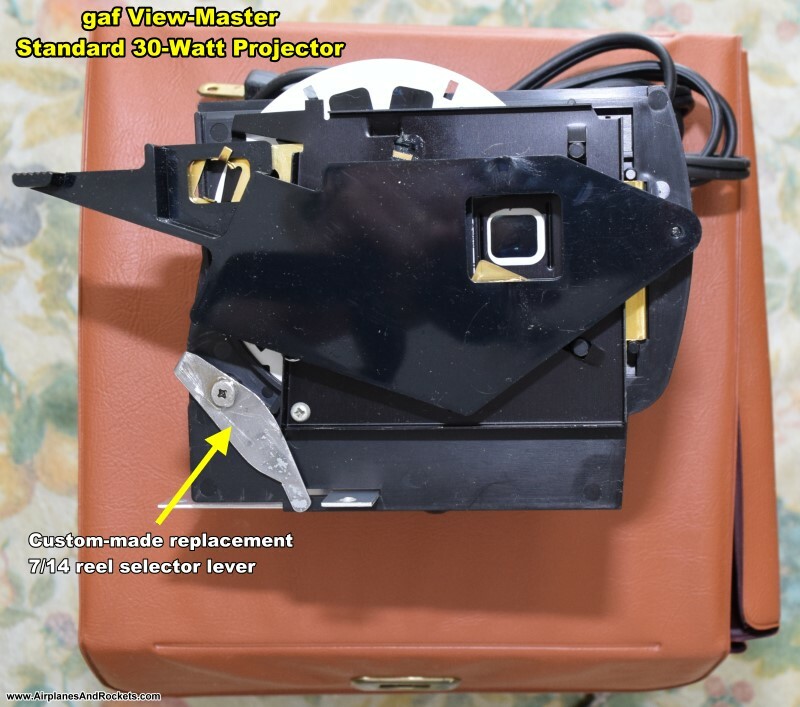 We discovered that the lever was missing in Melanie's projector when disassembling it for cleaning and photographing. An online search for a photo of the lever did not turn up an example for copying, so I needed to figure out for myself what the shape needed to be. A little experimentation with heavy cardboard resulted in the final product shown in the photo to the right. I was fabricated from a sheet of thin steel. It works perfectly, and only someone very familiar with the original would likely notice that it is not original equipment. * "Travel Wonders of American History," "Travel Wonders of American Cities," "Travel Wonders of America East," "Travel Wonders of America West," Travel Wonders of Our National Parks," "The Continent of Europe," "The Continent of South America," "The Continent of Africa," "The Lands of the Pacific," and "The Continent of Asia." Melanie with her View-Master Standard 30-watt projector showing scene from Little Drummer Boy reel set. 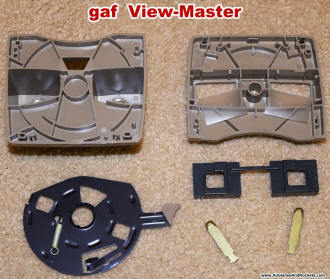 Breakdown of hand-held View−Master viewer. 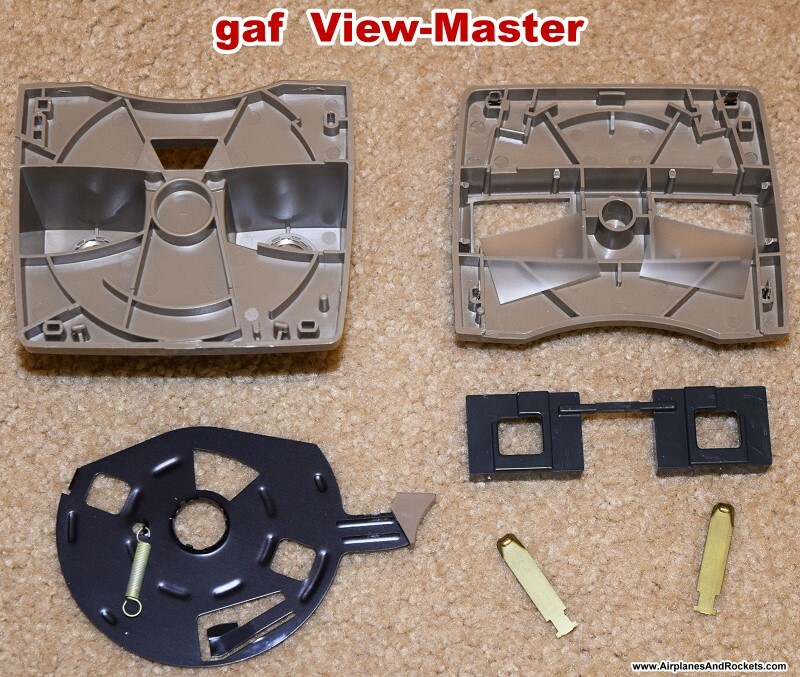 Top view of opened View−Master projector showing internal construction. 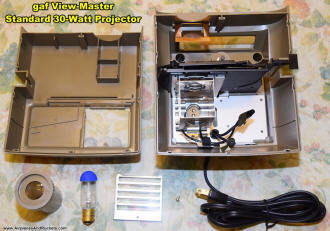 Inside-front of View−Master Standard 30-watt projector.